You are here: Home » Blog » Is Your Throbbing Pain After Tooth Extraction a Sign of Malpractice? Is Your Throbbing Pain After Tooth Extraction a Sign of Malpractice? Having a tooth removed isn’t pleasant and you can expect a certain amount of pain and discomfort. With that said, prolonged pain after tooth extraction is a sign that something is wrong, which can often mean that malpractice has occurred. Maintaining a good level of dental health is vital for preventing various ailments, conditions, as well as providing you with a set of teeth that function correctly with any issues. Unfortunately, the human body isn’t perfect and therefore daily wear and tear can take its toll. When it comes to your teeth, there’s the possibility of decay, damage, or infection — which in some cases requires the tooth to be extracted. Visiting the dentist, whether it’s for treatment, surgery, or just a check-up requires a lot of trust on your part. Even more so if your dentist will be removing a tooth entirely. Your dentist owes you a duty of care that ensures they will carry out treatments efficiently, carefully, and as safely as possible. But unfortunately, this isn’t always the case and negligence or poor technique can cause additional problems. In this post, we’ll highlight some of the reasons why people experience a throbbing pain after tooth extraction. This will help you to establish if malpractice has occurred and you should be making a complaint about a dentist. How Long SHOULD I Have Pain After Tooth Extraction? Everybody is different, and every body is different, therefore the amount of time that people feel pain post-extraction varies. While some are lucky enough to experience aches and pains for a few days before brushing it off, for others it lasts a lot longer — so don’t be surprised if you’re still feeling some pain after a week or so. The initial tooth extraction healing time is around two weeks as bone, and new tissue will have to grow into the gum pocket. During this period you should apply ice to swelling and wash your mouth out with salt water. If you’re suffering from a severe throbbing pain after tooth extraction, especially if it’s after the bone and tissue have healed, it sounds as though an underlying issue is occurring. This shouldn’t be the case if your dentist has carried out the procedure to a high-standard, or at least warned you about the possibility of complications later on, so there’s a chance that the pain you’re experiencing is due to malpractice. The following are the most common causes of pain relating to wisdom tooth extraction, and also instances where you might be able to make a complaint about a dentist. Although it may not always be possible to predict or avoid, tooth extractions that result in infection shouldn’t be happening. While it’s true that it’s possible for both the gum and the jaw bone to become infected, proper care and attention during and after the procedure will prevent it. Just because you have an infection, it doesn’t make you entitled to claim, but if it’s because your dentist has been negligent or failed to provide the necessary treatment, then they are the blame. Examples are not prescribing antibiotics or other solutions, as well as failing to identify the infection altogether. A certain amount of damage to the nerves around and below the wisdom tooth is expected during a wisdom tooth extraction. This means that there’s not much chance of you successfully claiming for this type of pain. With that said, your dentist should always make you aware of the risks of a wisdom tooth extraction. Also if they aren’t confident that they’ll be able to perform the extraction without complications, they should always refer you to a dental surgeon. An impacted wisdom tooth is one that doesn’t fully erupt into the mouth because of a blockage from other teeth. If wisdom teeth don’t have an opening to the mouth, pain can develop followed by inflammation, damage or infection of the adjacent teeth. Your dentist should spot these issues well before they become a more serious problem, and if they cannot treat it themselves, they should refer you to a dental surgeon. 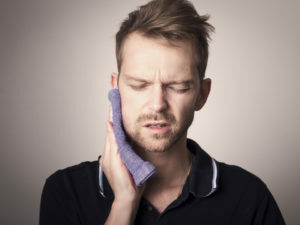 If you’ve visited your dentist with pain or discomfort while a wisdom tooth was pushing through, or if your wisdom tooth has damaged the adjacent teeth and this was ignored or not identified, there’s a good chance that you’ll be able to make a claim. Wisdom teeth grow in an unusual way when compared to other teeth, and keeping them clean and healthy can prove to be particularly difficult. It’s for this reason that decay is known to occur both before and after the tooth has pushed through the gum. This is something that your dentist should notice, but if they don’t identify decay, it means you’ll have to undergo an extraction or preventive treatment. In this case, you may be entitled to claim the extraction wouldn’t have been necessary if they have identified the decay. This can be more difficult to prove definitively, but nevertheless, it’s worth speaking to one of our experts to establish your best course of action. Are you experiencing a throbbing pain after tooth extraction? Your dentist may be guilty of malpractice. Get in touch with Dental Law Claims today to book your FREE dental claim consultation.